Rises in passenger numbers, alongside development programmes are heralding a new wave of airport construction in China. Matt Willey asks how the Chinese government and its aviation agency are accommodating such ambitious expansion plans. Waiting in the wings: Chinese airport authorities are seeking capital at home and abroad. China has been quietly moving to the front of the civil aviation pack for a number of years now. Yet only recently has the rest of the world begun to take notice. The most recent Civil Aviation Administration of China (CAAC) statistics indicate that more than a third of the China’s 133 airports are now capable of handling one million passengers a year. And with a further 55 hubs expected by 2020, it is expected that China will usurp Japan to become the world’s second largest national aviation market as early as 2010, with projected passenger figures of 950 million by 2020. These figures seem intimidating for an already stretched international aviation industry. But international hubs should not be worrying about accommodating massive passenger increases just yet. While there is no doubt that the international passenger market from China has vast potential, China still currently only just makes it into the top twenty international markets. Instead it is within the domestic aviation market that China is seeing the majority of its development. 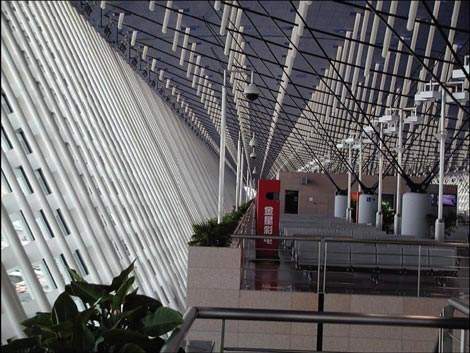 CAAC statistics predict that three airports per year will be constructed in China through to 2020 in order to accommodate growing passenger figures. While acknowledging that the majority of air travel within China is still primarily business-orientated, Zhang Guanghui, director of airports at CAAC, believes that, "as disposable incomes increase, more people will pay for air tickets". Airport development programmes in China are not purely a reflection of simple demand and supply economics, however. The Chinese Government sees airport development programmes as a means to provide an additional catalyst to regional development initiatives already under way. While proposed airports in the east are planned as a direct response to huge passenger and cargo increases, those in the West are seen as a way to spur investment in poor areas and to consolidate attempts to integrate China’s ethnic minorities. All of this development comes at a price. The Chinese economy is relatively buoyant, but there is not sufficient government capital available for such ambitious expansion plans. This is where China’s developing relationship with the west starts to come into play. In 1996, Xiamen Airport became the first example of a Chinese airport listing on the stock exchange in order to raise capital. Since then, there have been many more examples, most notably that of Beijing Capital International Airport Group, which listed on the Hong Kong exchange in 2000. The success of various airport exchange listings has been helped by the strategic decision by the Chinese Government to allow increased levels of foreign investment within its national airports by relaxing the prohibitive cap system, previously placed on domestic companies when it came to foreign investment levels. Almost immediately this has opened the door to foreign investors looking to gain a foothold in China. A number of the more forward-thinking airport investment groups took stakes in Chinese airports: Aeroport de Paris took a 9.9% stake in Beijing Capital and Copenhagen Airport developed its portfolio with 20% of Haninan Meilan International. As the aviation industry in China develops over the next decade and beyond, this early strategic investment may well prove a shrewd move. Despite raising capital for development programmes, foreign investment cannot create passenger traffic by itself. Historically the Chinese aviation system has been beset by policies and restrictions that have actively limited passenger numbers. In recent years, however, CAAC has been working towards abolishing restrictions, freeing up airspace in China and promoting private sector and start-up companies entering the Chinese aviation sector. The emergence of private sector airlines is a significant development in the Chinese market as it emphasises the culture-shift taking place. It takes place against the backdrop of a more open embracing of free market economics in the nation’s economy. A number of new carriers have emerged as a result of the relaxed legislation, such as United Eagle Airlines and Jade Cargo. However, issues remain that need to be ironed out in order for new private sector companies to flourish. The level of airport charges remains a contentious issue for many domestic and international carriers, and it is these that could affect new market entrants the most. CAAC and provincial Chinese governments still have ultimate control over charges, leaving the individual airports with little flexibility to attract new carriers. There is still a level of reluctance from Chinese airports to lower fees and charges because, unlike the west, there are relatively few secondary airports in China open to commercial operations. If an airline locates a desirable secondary airport, there is still no certainty that it will be cheap to operate. Shanghai Airlines is currently trying to negotiate lower fees and charges at Beijing’s secondary airport, Nan Yuan. Shanghai recently bought China United Airlines and is entertaining the idea of re-launching the airline as a low-cost carrier. "[Turning China United into a low-cost carrier] is a possibility," says Zhou Chi, chairman and chief executive of Shanghai Airlines. "It all depends on airport fees and costs." This approach of establishing a hub via the purchase of an existing carrier is not typical. CAAC is looking to make it much easier for airlines to establish hub environments without going to such extreme measures. Shanghai is being opened up, with airlines from around China being permitted to establish hubs at Shanghai Pudong and Hongqiao airports. CAAC deputy director general of international affairs and cooperation Wang Rong Hua says that the authority opened up Shanghai to meet the huge demand in that market. There are hopes that the CAAC move to open up Shanghai will herald the start of similar moves across the whole of China. Initially it seems likely that Guangzhou in the Guandong province will be opened up to greater competition. Already, China Eastern, Shanghai and Shenzhen Airlines have applied to the Guangdong Airport Group for permission to establish hubs there. Zhou Chi at Shanghai Airlines says the CAAC has yet to open the Guangzhou market, but Shanghai Airlines and others have applied in anticipation of the law being changed. "I hope Beijing and Guangzhou airports will open up to other airlines or else it would not be equal," he says. This reform from CAAC, alongside healthy long-term projections for the Chinese aviation industry emphasise just how dynamic the airport and aviation industry is in China at present. China presents huge opportunities and, as long as the development is managed well, could and should become one of the major players in world aviation.